The mother of the arrested BJP woman leader in the baby sale racket case alleged that her daughter had fallen prey to a political conspiracy and had been falsely implicated by the main accused. Juhee Chowdhury, the BJP Mahila Morcha leader, was sent to judicial custody for four days by the chef judicial magistrate's court here yesterday. 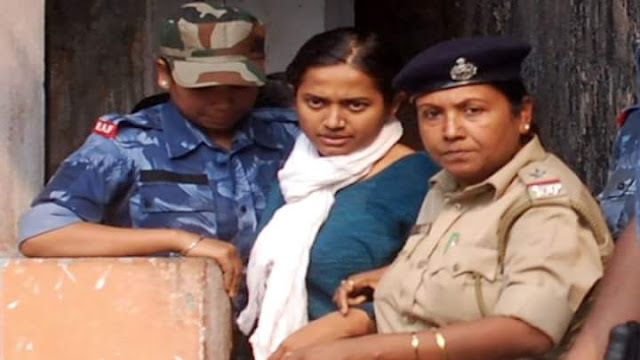 She had been arrested for allegedly helping Chandana Chakraborty, from whose orphanage infants had been sold to childless couples in India and abroad. Mithu Chowdhury, the mother of Juhee, told the media outside the court: "On January 26, Chandana had come to our home. Juhee is a political worker and many people turn up at our house with different problems to seek her help. My daughter is innocent and Chandana has falsely implicated her in the case." Sources in the CID that is investigating the case had said Juhee had planned to take Chandana to Delhi to get certain approvals and financial assistance for the latter's NGO that used to run the orphanage and a home for destitute women in Jalpaiguri. The sleuths had purportedly found photos of children who stayed at the orphanage in Juhee's possession. According to the investigators, Chandana had handed over gifts to the BJP leader for her "help". Juhee's mother, however, sought to brush aside the charges. "Juhee's father (Rabindranarayan Chowdhury) has been in politics for the past 27 years. Ours is a known family in Jalpaiguri district. Chandana has played tactically. On one hand, she came to Juhee, seeking her help and on the other, after she had been arrested, Chandana claimed that she was a Trinamul worker. My daughter has fallen prey to a political conspiracy," Mithu said. The CID sources had claimed that Juhee had transferred money to Chandana's bank accounts through the bank accounts of former's uncle and family friend. Mithu said hers was an affluent family and Juhee "does not need money from Chandana". Akhil Biswas, the lawyer representing Juhee, said in the court that some other intelligence agency should conduct the probe. "My client didn't have any idea of the affairs of Chandana's NGO," said Biswas. Juhee didn't speak to the media while being brought to the court and then taken to prison.